Curious about just how far your dollar stretches in San Francisco? We've rounded up the latest offerings via rental site Zumper to get a sense of what to expect when it comes to finding an apartment on a budget of $2,900/month. Listed at $2,895/month, this one-bedroom, one-bathroom apartment is located at 781 Corbett Ave., #5. On-site laundry is offered as a building amenity. In the top floor unit, you can anticipate a mix of hardwood floors and carpeting, central heating, a dishwasher, built-in storage space and generous closet space. Luckily for pet guardians, both dogs and cats are welcome. Walk Score indicates that this location is somewhat walkable, is bikeable and has good transit options. Here's a 416-square-foot studio apartment at 825 Post St., #211 that's going for $2,890/month. In the furnished unit, you'll get hardwood floors, a dishwasher, a wide screen TV, wooden cabinetry and ample natural light. Building amenities include on-site laundry, outdoor space, a roof deck and an elevator. For those with furry friends in tow, know that cats and dogs are welcome on this property. According to Walk Score, the area around this address is a "walker's paradise," is quite bikeable and boasts excellent transit options. Next, check out this studio located at Scott and Hayes streets that's listed for $2,875/month. Apartment amenities include hardwood floors, a dishwasher, stainless steel appliances, generous closet space, wooden cabinetry and plenty of windows. The building features on-site laundry and garage parking. Pets are not permitted, however. 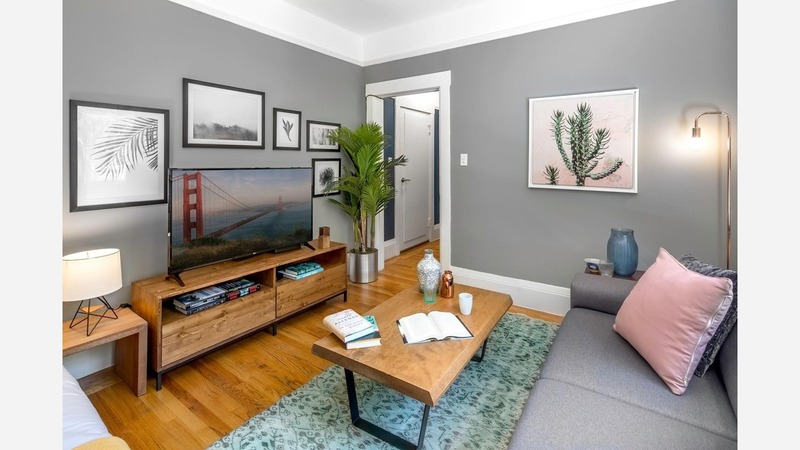 Located at 149 Castro St., here's a one-bedroom, one-bathroom that's also listed for $2,875/month. The building offers secured entry and on-site laundry. In the unit, you can anticipate a mix of hardwood floors and carpeting, stainless steel appliances, three closets and built-in shelves, but neither cats nor dogs are permitted. Per Walk Score ratings, the surrounding area has excellent walkability, is very bikeable and has excellent transit. Listed at $2,857/month, this 729-square-foot, one-bedroom, one-bathroom townhouse is located at 502 Gonzalez Drive. In the apartment, you can expect hardwood floors, generous closet space, high ceilings and wooden cabinetry. Fortunately for pet guardians, both dogs and cats are allowed. Per Walk Score ratings, this location is very walkable, is quite bikeable and offers many nearby public transportation options.